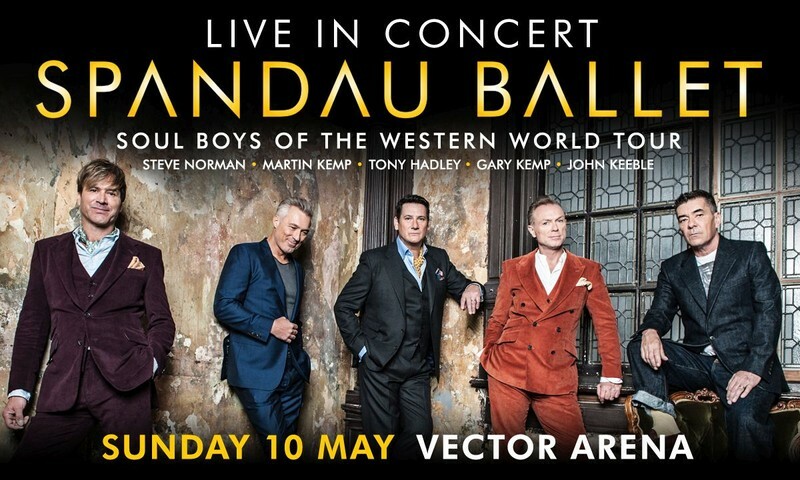 Stewart & Tricia Macpherson and Dainty Group announced today that Spandau Ballet, one of the most successful and influential British bands of the 1980's, will bring their 'Soul Boys' Tour to Vector Arena on Sunday May 10, 2015. Ticket options range from $99.90* to $139.90* (*plus transaction and credit card charges where applicable). Tickets and VIP packages will go on sale at 9am Thursday November 20, 2014 from Ticketmaster. All five original band members of Spandau Ballet – Tony Hadley, John Keeble, Gary Kemp, Martin Kemp and Steve Norman will come together to perform their smash-hit anthems for Australasian audiences for the first time since their 2010 Reformation World Tour which saw the band reunited. Ahead of the 2015 concert tour Spandau Ballet were in New Zealand, having attended a special screening in Auckland of their new film 'Soul boys of the Western World' which was the 2nd highest grossing film in the UK when it was released there earlier this month. The band's visit also promoted their brand new best-of album The Story – The Very Best of Spandau Ballet which also features 3 brand new tracks, in stores now and online via Warner Music New Zealand. Spandau Ballet defined the 80's in the way that The Who defined the 60's, Bowie defined the 70's and Oasis defined the 90's. They have sold over 25 million records worldwide, scored numerous multi-platinum albums and amassed 23 hit singles across the globe including Gold and True, which have endured for more than three decades. Emerging from Soho's ultra hip Blitz Club in 1979, Spandau formed at school in North London before becoming the hottest unsigned band on the planet. From underground fashion and music obsessed working-class Londoners, to global super-stars, the band set the pace, the styles and the sound of the 1980's. Not only did their albums sell by the millions, but their look and style impacted on the fashion world and beyond. They created their own style, combining creativity with entrepreneurship and the spirit of the youth of the early 80's.